Part 1 Alloy modification: Designing oxidation-resistant alloys; Performance of gas turbine seal materials in high temperature conditions; The influence of alloying elements on corrosion of ferritic steels in combustion atmospheres; Improving the metal dusting resistance of alloys. Part 2 Surface treatment: Effect of gas composition on lifetime of surface treated alloys; Novel diffusion coatings for ferritic-martensitic steels; Steam oxidation and the creep strength of power station materials; The errosion-corrosion resistance of aluminised and uncoated chromium ferritic steels; New oxidation-resistant coatings for steam power plants. Part 3 Test methods and surface conditions: Reliable assessment of high temperature oxidation resistance; Cyclic oxidation test practice; Analysing thermo-mechanical fatigue; High-temperature corrosion life evaluation; Hot erosion wear and carburisation; Corrosion behaviour of boiler and waste incineration steels. Part 4 Modelling: Modelling the in-service behaviour of boiler steels; Modelling corrosion in heat exchangers; Modelling oxidation of alloys at high temperatures. High-temperature corrosion is a major problem affecting sectors such as the power generation, aerospace and metal-working industries. This important book summarises a wide range of research on ways of dealing with this important problem. The first part of the book reviews ways of modifying alloys to improve high-temperature corrosion resistance. The second part discusses surface treatments such as pre-treatments and coatings. The third part of the book summarises research on testing for high-temperature corrosion resistance and the development of common testing standards. It also reviews research on the behaviour of alloys in a wide range of service conditions such as furnace and boiler environments. The final part of the book discusses ways of modelling high-temperature corrosion processes to improve material performance and service life. 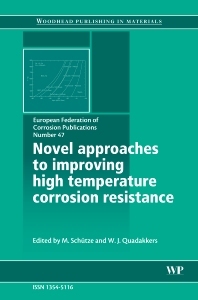 With its distinguished editors and team of contributors drawn from some of the leading centres of research in the field, Novel approaches to improving high-temperature corrosion resistance is a standard reference for all those studying and dealing with high-temperature corrosion. Professor Dr-Ing. Michael Schütze is Director of Karl-Winnacker-Institut der DECHEMA (The Society for Chemical Engineering and Biotechnology) in Frankfurt, Germany. He is also President of the European Federation of Corrosion (EFC) and Chair of the EFC Working Party 3 (Corrosion by Hot Gases and Combustion Products). Dr Ir W. J. Quadakkers is head of the High Temperature Corrosion Section within the Institute of Energy Research at the Forschungszentrum Jülich, Germany.